I first went to Mexico as a backpacker over winter break in 2007. My total budget for three weeks and 5,000 kilometers was $500, which ended up covering transportation, lodging, food, drinks, and a healthy dose of souvenirs and presents. Swiss friends drove down from Mississippi, picked me up in Louisiana, and drove on down to the border. We left the car in Laredo, Mexico (a long story onto itself), and hoped on a bus to Mexico City. We lounged on the beach in Puerto Angel and visited Indian villages around San Cristobal de la Casas. We played cards on the zocalos of Oaxaca and Palenque. We spent many nights in buses, since they both got us from one place to the next and saved us the cost of a hotel night. I remember arriving in Acapulco around 4 one morning and exhaustedly drinking vodka and coffee outside a small café where only a thin tarp protected us from the pouring rain until it was late enough to go to a hotel that wouldn’t charge us for that day. Or taking 12 hours to drive 200 kilometers on dirt roads in the mountains, once again so exhausted that we slept on the floor of the bus between seats. Or eating blue corn tacos made by an old woman crouching against a wall in Mexico City, before heading on the subway to go to the acclaimed anthropology museum, and feeling absolutely content. It was a trip of countless adventures, discoveries, and encounters, the kind of which are only possible when backpacking and having all the time in the world, even if it’s never enough. It was a trip that made me fall in love with Mexico. We were broke college students, and fine dining had no room in our plans. We didn’t try to eat exclusively Mexican food, but our budget forced us to and we followed the recommendations of Let’s Go Mexico for the best cheap places in each city we visited. I knew nothing about Mexican food then (we occasionally made tacos with high school friends in Switzerland, with Old El Paso taco shells and seasonings, feeling worldly, and what I ate in Louisiana was really Tex-Mex), so every bite opened me up to new flavors. I would eat the salsas on our tables by the spoonful to unpack their different taste layers—once even getting a real high from the heat of the chiles, something I’ve (thankfully?) never experienced again. I fell in love with tacos al pastor, that perfect combination of pork, chiles, and pineapple, which today remain one of my favorite foods. I was constantly looking for the next dish I hadn’t tried yet, to a point that became almost ridiculous, especially since then my career aspirations were to become a war reporter for the Associated Press, not work in food. It was, in retrospect, an unconscious behavior, just another materialization of a love of food that didn’t become intentional until I graduated college and looked for my first real job. I dreamed of going back to Mexico ever since then, but it took me until May 2013 to make it happen, when attending Mesamerica in Mexico City. 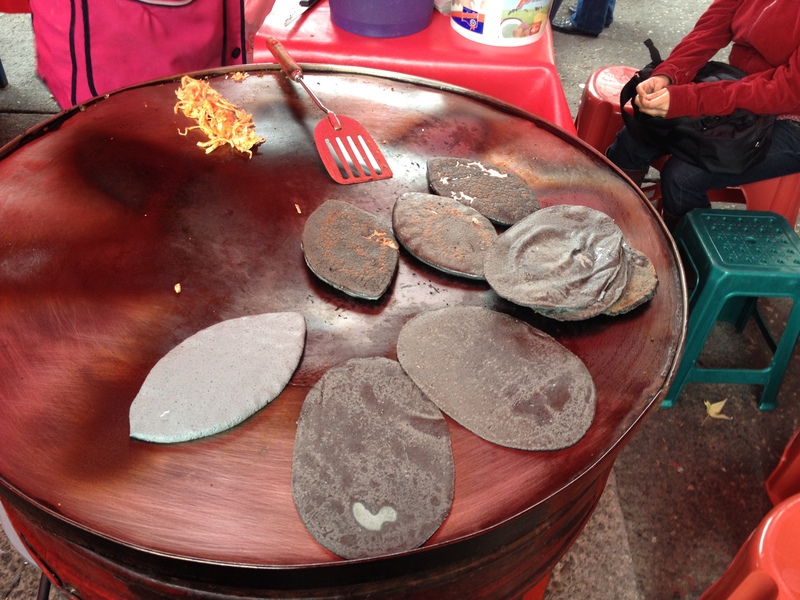 Then I went to Acapulco in October for the first Foro Mundial de la Gastronomía Mexicana. And back to Mexico City in November, to research a profile of Enrique Olvera of Pujol and another piece on the next generation of Mexican chefs. Those came out in the March issue of Food Arts, and appeared online the day after I came back from yet another visit, this time to Merida in the Yucatan, to celebrate a friend’s birthday. I’ll be back in May. I am lucky. Those trips have been different. I’ve eaten world-class tasting menus in the best restaurants in Mexico City and traditional dishes prepared by village cooks over a wood fire, alongside experts who could explain and contextualize it all. They have offered the same contentedness and joy, however, and have rekindled a love that I hope never becomes dormant again. What a beautiful piece, Anne. I’ve never traveled in Mexico that way, but your words brought back many wonderful memories. How kind of you to say that, June! Thank you!